Small Stream Reflections: February In "Brook Trout Forest"
February In "Brook Trout Forest"
Yesterday morning I picked up Rowan and we had planned on fishing a stream that held some promise. A stream that could hold brook trout in the 14-15 inch group. When we arrived we found that the stream had a bit of a problem, "access"...we had to walk a large field that was filled with last years corn stubble. We reached the tree line which was the easiest part of the trek. Once in the trees we encountered those briars, those devils that will draw blood and keep the "aqua seal" company in business. Drudging through mud and pockets of ice we finally saw the stream. It flowed rather slowly and had some deep holes. The possibility of finding some trout was there but trying to fish for them was terrible. So a decision to go to another stream was made and it proved to be the right choice. You have heard me make mention of "brook trout forest" those special places where the body mind and soul and at peace. Where beauty in so many forms are present. Well here it is. The little stream was one where you could just walk along it and have a complete day. It meandered down and made some interesting curves. It's dark slow pools were almost black. It was in these pools that willing brook trout took our flies. Wild, in a place that sees maybe one angler a year. These brookies were extremely sensitive and I spooked more than a dozen fish. Rowan trying to make a cast into one of those slow dark pools. Trout were rising and a well placed fly brought a response. Rowan with a wild jewel. The stream was full of these fish. Each one seemed to be prettier than the last. We turned over some rocks in the stream and found out why there were so many healthy brook trout in this stream. The stream had golden stonefly nymphs, caddis larva, and aquatic worms. It was a tout buffet. We both agreed that this stream would be a dry fly heaven come May and June. A pool in brook trout forest. Just downstream from here Rowan took a large brookie, one of many I think will be found in this little stream. Such a lovely little stream with that many places for trouts to hold. Sounds as though they have a good food source too. Thanks for sharing, Alan. Bill ample food, marginal stream space. It was crazy where we saw fish. lovely stream & lovely trout as always Alan. Makes for a great day mate. Bill we will be back there that's for certain. It was a shame you never got to wet a fly on the first stream after the effort you and Rowan put in getting there, at least you managed to connect with some wild jewels on the second water. Alistair such incidents are sickening. I hope the pollution was the result of an accident and not stupidity. It's amazing what a small stream can hold as far as size of trout and amount. Recognize the fly posted below? I certainly do recognise that fly! Props for trying to fish that first place with the 15"ers in it. With briars and brush guarding the stream it sounds like those big ones are living in a good place. 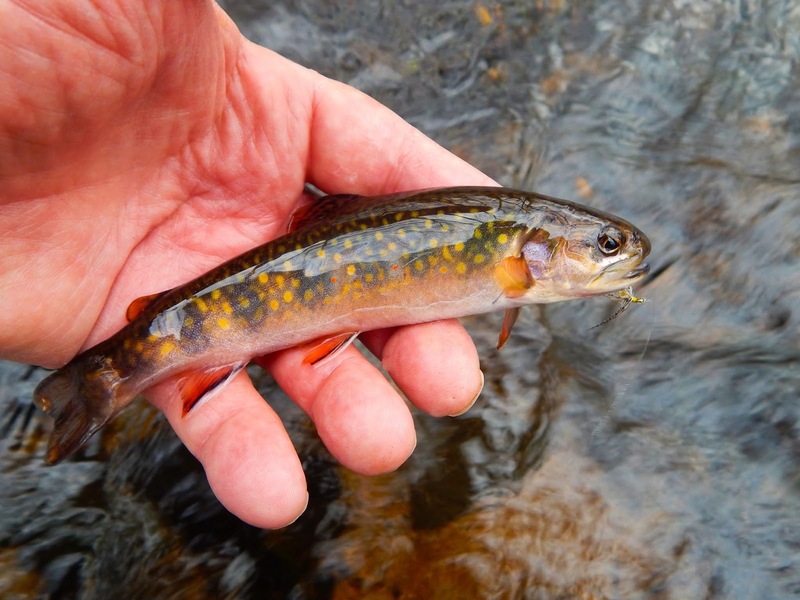 The second place at brook trout forest is beautiful as were the inhabitants caught. 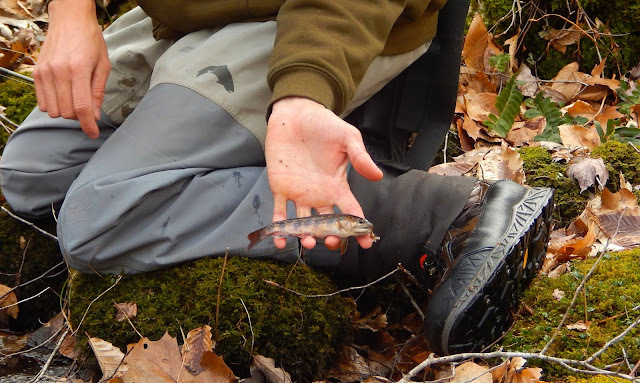 Fishing those small streams is a great skill with the brookies as skittish as they are. Sam we will figure out where to better access that stream. Upstream it takes on a different look with boulders rocks and somewhat swifter flows. The brookies were so skittish and I saw more wakes than fish to hand. They really are alert, aren't they Alan? I bet it takes a lot of effort and even some luck for the herons and other predators to get them. I have caught a few brook trout on the Swift that you could tell they had a close call at some point. Sam I took a photo of this stream trying to capture the undercut banks. Unfortunately it did not show it well. But the undercut was at least a foot. No heron is going to bother them in there. That is one of the reasons there are so many brookies in that stream. I am still fascinated with the smallness and tightness of your Connecticut streams and the gems that live and thrive there! You must really pick your cast very closely and execute them with precision! I can see that the end results are very much worth the effort! I am up to this challenging style of fishing but first, I need to find some brook trout waters! There are kinda scarce here in southeastern Ohio! We do have a boat load of sunfishes of all sorts! Definitely worth the effort boys..